Christmas Gift From Twistfix! SDS Drill for just £79.95! We have a fantastic offer especially for Christmas where you can get your hands on a high quality 850 watt professional SDS drilling machine with a 3 year guarantee for just £79.95! Whether you want to grab yours today for the man who loves DIY or simply add one to your tool kit, these are ideal. As part of our Christmas package you will get the SDS drill, a 3 jaw chuck adaptor, 2x SDS chisels and 3x Drill bits! You must order before the 21st December 2011 for pre-Christmas delivery! All in all this totals £160 worth of goodies and you will just pay £79.95. A saving of £80! If you are stuck for that perfect Christmas gift for guys then look no further. This offer is ideal for builders. Why not present him with a SDS drill complete with a Free accessory pack this Christmas. 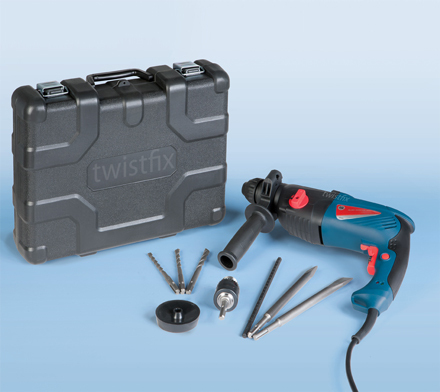 Power tools are ideal presents for those keen in DIY which is why Twistfix put together this great package all for just £79.95! The drill offers triple function features, including rotary drill, hammer drill and chisel only mode. It is 230volt drilling machine which has powerful impact energy of 3.3j! It is this powerful impact energy which results in the rapid completion of all those odd jobs around the house. Buy your partner one for an early pre-Christmas present so that he can complete all those DIY jobs you have been begging him to do in time for Christmas!